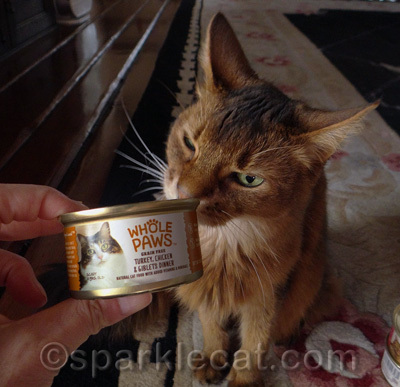 As you might recall, my last post about Whole Paws, the new cat food from Whole Foods Market®, had Binga giving me the evil eye because she had to wait for the taste test. Well, finally today is the day! And it didn’t come soon enough because Binga has been in a bad mood for the past two weeks. 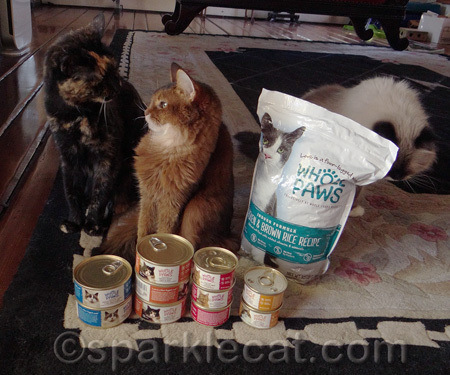 We tried out the canned food first, since that is what we normally eat. Even though the Turkey, Chicken & Giblets Dinner contained some of my very favorite flavors, I did not like the paté texture and turned it down. 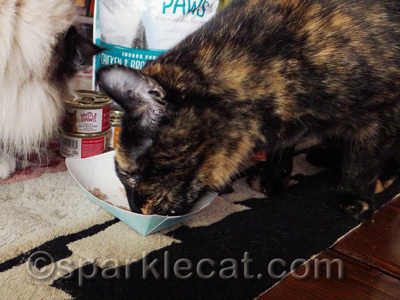 Binga loved it, though — and so did Boodie. Next, my human thought she would give us the Shredded Chicken Dinner in Gravy. It’s actually more chunk like than shredded, as you can see, which is the texture I usually prefer. But I wasn’t that impressed. 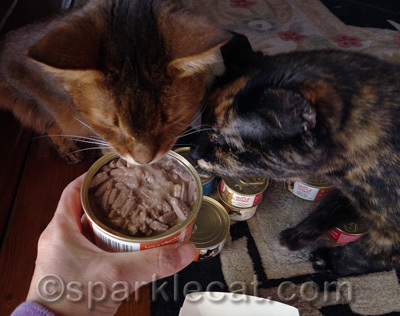 Again, Binga and Boodie loved it. By the time my human pulled out the Shredded Whitefish, Chicken & Tuna Dinner in Gravy, I’d decided to bow out of the taste testing and leave it to more enthusiastic kitties. I was sneaking the Beef & Chicken Dinner! I also licked all the gravy out of the can of Shredded Chicken Dinner. And I was trying to be so blasé. 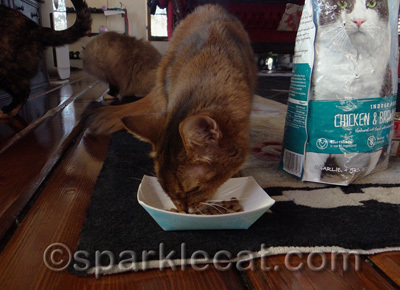 We don’t normally eat dry food except as an occasional treat (because of the way it is processed dry food can’t match the higher protein to carb ratio of canned food), but my human said we could try out the Indoor Formula Chicken & Brown Rice Recipe. 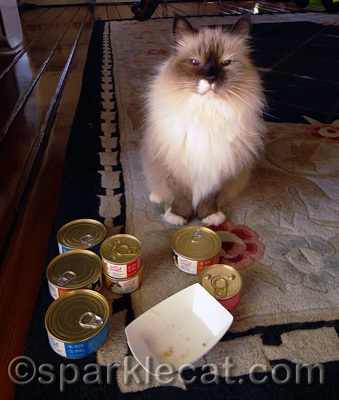 It looks like SOMEkitty, cough, cough, Binga, has already tried to get a taste test preview! Since it was already open, I decided to help myself. Unfortunately, so did Binga. As you can tell by my blur, I was quick to get out of there. But my human took the bowl away from her and let me eat the rest of it later in peace. Boodie is a member of the clean plate club! 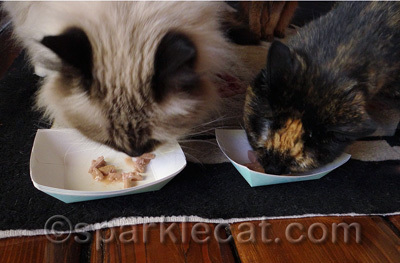 So here is our assessment: Binga and Boodie loved everything from Whole Paws that was put in front of them. The only food I liked consistently was the dry. But then, I am famously picky. My human actually was shopping at Whole Foods Market right before coming home to help me on this post and she discovered that the Whole Paws line of cat food is very reasonably priced compared to much of the premium cat food she regularly buys. In fact, it is less than a lot of the other brands. Whole Paws is the first time a private store brand has offered grain-free pet food, and even though only two out of three of us gave the canned food our paw of approval, one thing we all can agree on is that this is a great trend! 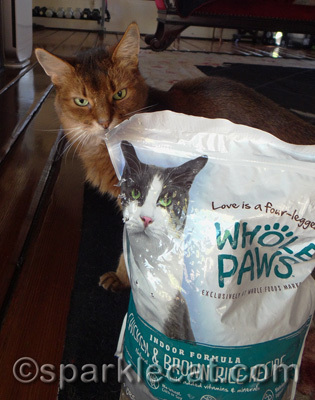 Plus Whole Paws food ingredients are all sourced from the U.S. or Canada (except for lamb, which comes from New Zealand), which makes my human feel safer about feeding it to us. 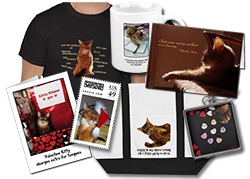 Did you know that 91% of pet owners consider their pets part of the family? Which means the other 9% must be humans who consider themselves lowly assistants to their cats… like my human. In which case, they should only supply their overlords with the best food possible — and Whole Paws is a line they should definitely check out! Sweet review! 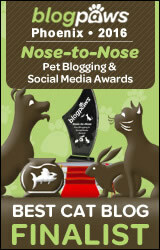 We have been thinking about switching up our cat food and this was one I was considering. Maybe itÂ´s because of the stooopid taxrules in Sweden ?! Looks like another taste test for us coming up! Gotta try out the pate styles – we don’t do chunky or shredded food. We won’t be trying the kibbles though because they have rice. We’re completely grain free in this house. Overlords. We like that! We have instructed Mommy to go to Whole Foods. We like the idea that grain-free cat foods are catching on to the point that private label options are beginning to make it to market. Hopefully this will be a trend that helps make healthier eating more affordable for more kitties. 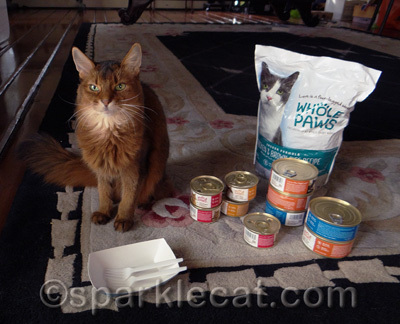 My human was nervous about the taste test because I didnâ€™t like Whole Foods Marketâ€™s 365 brand cat food either. 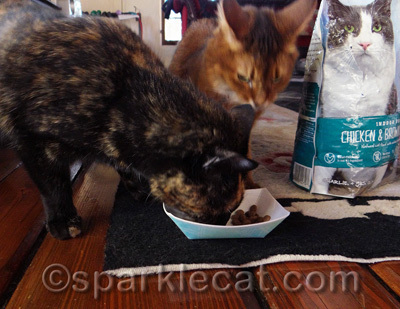 I think we like the kibble because our humans donâ€™t like feeding us kibble. Weâ€™re rebellious kittehs. 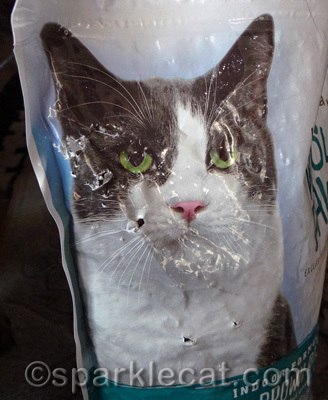 The punctured bag might be our favorite photo of the bunch, but a close 2nd is Boodie’s satisfied grin! And we understand have to remain picky acting…hate to ruin the rep, hahameow! Nice post and details of your taste testing! Truffles favorite was the dry too, Sparkle! I can see why Binga poked holes in the bag…you can even smell the goodness! I am picky too Sparkle and I won’t touch pate either. Small chunks in gravy are my favourite. It looks like that dried food was tasty too but I rarely get that. At least you liked the dry. “Hoovered it down.” LOVE that! Maxwell: I understand the concept of picky, Sparkle. Me too! 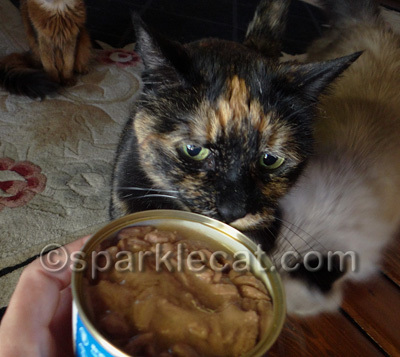 you are a picky eater, Sparkle! 😀 It’s nice to see good quality foods out there that are easier for folks to find and afford. 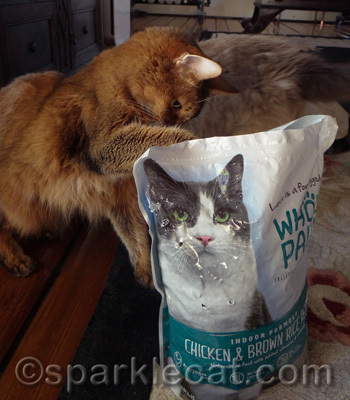 it’s nice to see evidence of other kitties assaulting bags of food too 😀 Thanks for sharing the review!